Park Synagogue in Cleveland Heights is one of Greater Cleveland’s most architecturally significant structures and, despite its dating only from the late 1940s, it has historical significance as well. Park is notable for its being the only work of the world renowned architect, Eric Mendelsohn (1887-1953) in Ohio, for its great beauty-architectural and natural-which appeals to virtually everyone who experiences it, and for its architectural influence on so many religious structures and complexes to follow. Park Synagogue is also known as Anshe Emeth Beth Tefilo Congregation, a merger in names of two congregations around 1920. Anshe Emeth was the older; it was founded by twelve Polish immigrants in 1869. First meeting on Seneca Street (West 3rd), the growing membership moved to Erie Street (East 9th), East 37th in 1904 and East 105th in 1921-2. Also called the Cleveland Jewish Center, this last structure was one of the first synagogues in the United States planned in the “Jewish Center” mode-with athletic facilities (gymnasiums and an indoor pool) along with rooms for worship, social halls, the school, a library and offices. The congregation changed from Orthodox to Conservative in 1922. By 1943 it was decided to acquire the Park School property in Cleveland Heights, consisting at the time of several frame structures, as a Heights branch. But soon a great new complex was envisioned for the new setting and in November 1945 a building campaign was launched at a dinner in the Carter Hotel. Eric Mendelsohn was hired as chief architect. Designed by world-renowned architect Eric Mendelsohn, Park Synagogue is one of the area’s most outstanding works. Mendelsohn had had an illustrious career in Europe. The most admired products of this phase were his Bauhaus-inspired yet rounded and “expressionist” department stores and the Einstein Tower at Potsdam, Germany. But Mendelsohn designed many churches as well. Displaced by the Nazi regime, he settled in the United States in 1942 after passing through England, Holland and Palestine and designing notable buildings in these countries. Park was the architect’s first American synagogue commission, though the work-even from the very first sketches-influenced congregations in other cities to commission him, and there are now four Mendelsohn-designed synagogues in the country. Park is the largest and most ambitious; all are in the Midwest and can be classified as “Centers.” Three other synagogues’ plans did not materialize. The building site, which grew to 33.5 acres, was quite heavily wooded but had ideal soil for the type of structure planned. Rock formations, however, made excavation difficult. A 40-foot ravine ran through the property, and it was decided the new complex would be situated on the property’s highest point, near the center. A sprawling complex was conceived, which took full advantage of a spectacular setting, much in the same manner as does Frank Lloyd Wright’s stunning “Fallingwater” near Pittsburgh; both are “organic architecture.” The complex was several sections, including auxiliary service structures. The Park School’s buildings (one, used by the synagogue as a library, burned about 1949) and its playground facilities remained. 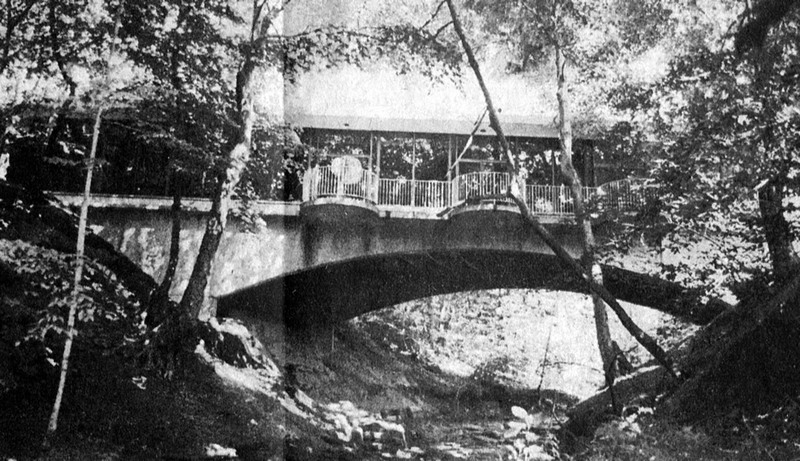 Park’s day camp was already on the grounds by 1949. 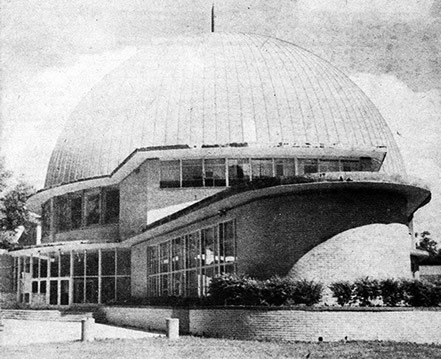 The dramatic complex, with many circles and curves in its sweeping design, was originally intended to form on the north end an apex with an open-air amphitheater and acoustic shell stage; the intended location eventually became instead the site of the Kangesser addition. The school, too, was originally intended to be across the ravine. Mendelsohn’s scale model for Emanu-El Temple and Community Center in Dallas, never executed, shows this structure too was to have the arrangement. Contractor was the Hadlock-Krill Company. Certainly the dominant feature of Park’s design was its enormous dome, one of the largest in the world. Scaffolding for the great dome required 180,000 feet of lumber and took eleven weeks to fully assemble. In all, the dome has 18,000 square feet. Lighting effects were designed at Nela Park, emphasizing the Ten Commandments tablets on top. Two giant tablets were later to be the focal point of the architect’s “Monument for Six Million Jewish Victims of the Nazis” in New York—never executed. Mendelsohn was very firm about following his architectural concepts, and one feature he insisted on, despite much congregational resistance, was clear glass windows everywhere-absolutely no stained glass. During the course of synagogue planning, the architect remodeled much of the interior of Rabbi Armond Cohen’s own home on Euclid Heights Boulevard, to conform with International Style principles. The first service at the new synagogue, though it was far from completed, was held Sept. 9, 1950-a “Selichot” service. The street address was listed as Euclid Heights, but in time Mayfield Road came to be considered the main entrance-and official address of the complex. Each street has formal gate entrances, but Mayfield has three drives leading to the complex. The principal building dedication activities began December 8, 1950, and continued through December 19th. For opening ceremonies Rabbi Abba Hillel Silver, who had preached at the dedication of the East 105th Street structure, gave the address. On December 10th the Cleveland Chamber Orchestra, conducted by Laszlo Krausz, performed. Leonard Ratner was Building Committee Chairman, and construction costs were quoted in the local media as between $1 million and $2 million. The new school was not officially completed for several more years. Meanwhile the auxiliary buildings were used instead; it is a Jewish tradition to furnish classrooms before a sanctuary when all cannot be constructed at once. But what was completed and opened to the public that first December was a restrained display of extraordinarily beautiful, yet functional, architecture. 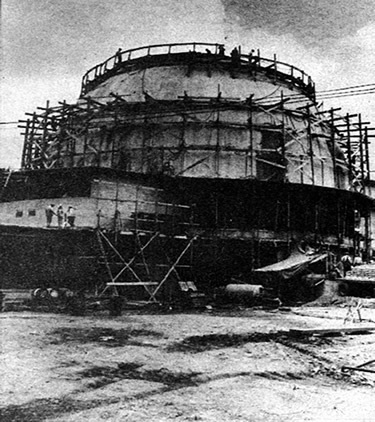 Park synagogue’s 125-foot high dome, under construction in 1949. The dominant theme seen throughout the main building is the circle-in the dome, shape of the sanctuary, and in the “porthole” windows in many large and smaller rooms. Throughout most of the architect’s career, he had favored dramatic curves of glass walls and circular stairwells. A circle is also implied in the crown theme, a general symbol of the synagogue used to this day in programs and other printed materials. This is based on Talmudic references to the “crown of Torah,” “crown of priesthood,” “crown of a good name,” as well as a “crown of royalty.” The Hebrew letter “shin” is another Park Synagogue logo; Miller Chapel candelabras are a variant of this letter. The main sanctuary, which overlooks the woods with its almost entirely glass sidewalls, seats over 1,000. The main ark is a natural maple stain on a mahogany podium. Mendelsohn designed the silver decoration for the original Torah covers, prepared in Tel Aviv. The curtain was woven in silver and gold threads. All decoration is focused on the ark/pulpit/ platform area. A metallic crown stands atop the ark which, along with its surrounding walls, is decorated with the above-mentioned symbols. An exquisite blue glass and bronze disc-like Eternal Light, reminiscent of the suspended stairway light of Mendelsohn’s De La Warre Pavilion of 1933-4, is suspended in the center of the permanent canopy formed by angled decorative panels, all lighted with cold cathode ray lights. All seats face inward on the perimeter of the congregation, conforming to tradition. Prevalent colors are soft earth tones. The industrial linoleum floor, some of which is carpeted, was daringly used in 1950 for this type of setting. Mendelsohn was ever intrigued with new technology. Miller Chapel, reached via a glass-enclosed, curved corridor, was designed for daily and children’s services and small weddings. The rounded front has a golden grille and figures of sheaves of wheat, pomegranates, and grapes in gold and silver reminiscent of the Biblical description of the high priests’ roles. The Study designed for Rabbi Cohen overlooks the ravine. The original assembly hall is by the sanctuary; they are joined on the High Holidays (adding some 700 seats to the Sanctuary), an innovative concept in 1950 which was universally copied. The largest doors in the complex are here, between the assembly hall and exterior courtyard— a pair of stainless steel and plate floors, each half said to weigh two tons! The courtyard was inspired by those of the ancient Temples in Jerusalem. Courtyards are another feature commonly found in most fair-sized synagogues constructed after Park; courtyards are often the setting for a congregation’s “sukkah” each fall. However, the architect’s Metal Workers’ Union Building in Berlin, built back in 1929, also had such a courtyard. In May 1953, 21 classrooms on two levels were dedicated as the “Educational Center”; it had its own auditorium/theatre. The Kravetz Library was also dedicated at that time, and a new gift shop opened. The Foundation School of Park Synagogue opened for kindergarten through third grade in 1958; it evolved into the Ratner Day School, now renting space in a South Euclid school building. Since 1958 a nursery and Montessori school associated with the synagogue also were established. The first of many large international Contemporary art shows was held at Park in 1961. It is said to have done much to further the cause of modern art in the region. But Park had long been artist-and craftsman-oriented. For example, ark curtains in the 1950 Chapel were fashioned in a California art colony. By the middle ‘60s still more space was sought. Large donations culminated in the million-dollar addition dedicated in March 1968, adding Kangesser Memorial Auditorium (often used as an auxiliary sanctuary and recently for school space after a fire in the spring of 1986 destroyed a frame school/camp building), another large assembly hall, a sizable art gallery—in three sections—constructed right over the ravine and numerous smaller rooms, such as an additional cloakroom, bridal room, etc. Architects were Michael Gillis and Myron Manders. Kangesser was furnished with a very distinctive glass tabernacle, designed by Israeli/Canadian artist Yaacov Agam in 1971, the same time Agam’s 10-by-90-foot sliding, multi-colored glass panes were installed in the main art gallery. Several Agam serigraphs also were added to the growing art collection. Park Synagogue is a Cleveland Heights Landmark and has been featured on several Heights Heritage Tours. It was the first synagogue in Greater Cleveland built in a fearlessly modernistic vein; all other synagogues had Byzantine, Moorish or Romanesque themes. But Mendelsohn did not conscientiously create a new style. The quest for eternal beauty was his pursuit. If Park at first looks like other Contemporary religious structures around Cleveland and elsewhere, when experiencing it one comes to realize its subtleties and special grace-all guests feel comfortable here. As far as resembling other buildings, remember-the features in question probably were here first. In any case, the complex represents the finest Greater Cleveland has to offer. Ken Goldberg, Librarian for the Northeast Ohio Areawide Coordinating Agency (NOACA) also is a Trustee of the Cleveland Heights Historical Society, a former member of the Cleveland Heights Landmark Commission and a regular contributor of historical materials to Focus on the Heights. This article first appeared in the July 11/17/1986 issue of Habitat newspaper.